The Vu Ryte VUR-59GR offers a sleek and efficient profile to help you maximize your workspace and keep you documents positioned in the most ergonomic correct position possible. The VUR-59GR attaches to your adjustable monitor arm (purchase separately). 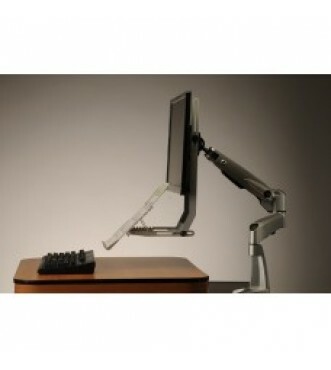 Adjustable in height, depth, and angle to accommodate documents of almost any size. 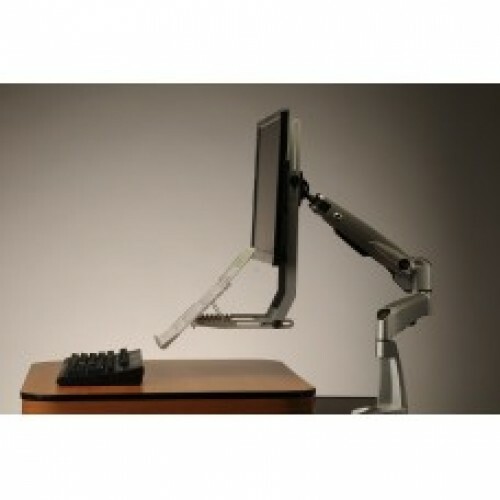 Helps to eliminate strain to your neck from trying to view awkwardly positioned documents. Placing paperwork flat on the desk, forces users to crane their necks down to read them, straining the neck and shoulders in the process. Standard document holders keep these reports at an angle, but are unable to hold them at an ergonomically-sound height. Even users who rely on monitor arms don’t get to reap their benefits when forced to stare at a sheet of paper on their desk, tilted their entire heads up and down between paper and screen instead of just shifting their eyes. In addition to its placement underneath the monitor, the 59GR boasts some impressive adjustability. Eight and a half inches of adjustable height, five and a half inches of adjustable depth, and seven easel angle settings ensure that you can find the most ergonomically comfortable position for yourself. Adjustment requires loosening the appropriate thumbscrews and sliding either the vertical support arms to adjust height or the easel arms to adjust depth. The lip of the easel is detachable and can be hooked onto one of four pairs of holes to adjust the easel’s vertical size. The VUR-59GR attached directly to your monitor keeping you documents as close to that eye-level ergonomic sweet spot as possible. Users who transpose a lot of information from paper to computers in their daily work should also see a slight productivity improvement. The 59GR is easy to assemble and to install on your monitor, simply loosen the top two screws on the back plate of your monitor (VESA plate) to slip the 59GR between the VESA plate and the monitor and replace the two screws when done -may take about 15 minutes in all to get back to work. Some monitors with recessed back might require longer than standard screws for installation.